Area of operation: Kanyakumari, Tirunelveli & Tuticorin Districts, Tamil Nadu. 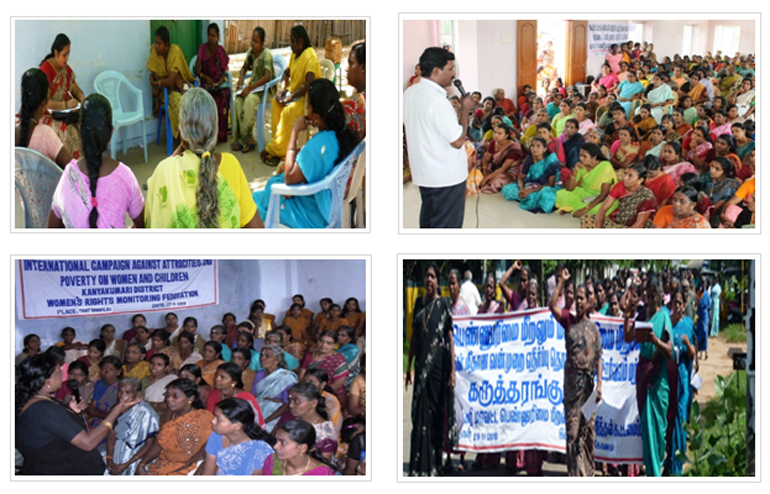 Conducted 17 District level campaign on protection of women from domestic violence in collaboration with State Women Commission - Tamil Nadu and Social Action Movement Tamil Nadu & Pondicherry. 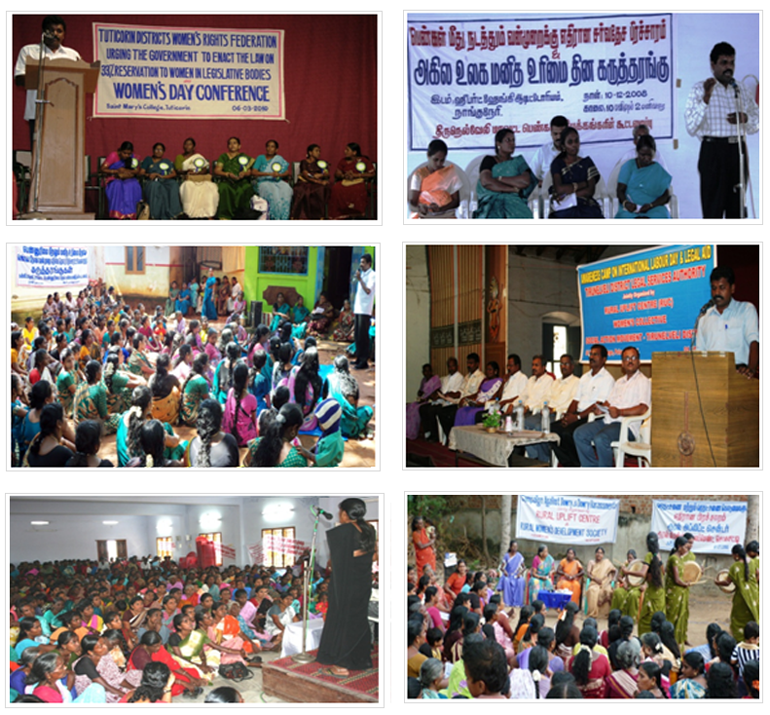 2030 women participated in the seventeen programmes held at Nagercoil, Palayamkottai and Tuticorin. Conducted 18 days capacity building training on Advocacy skills benefitting 664 persons. 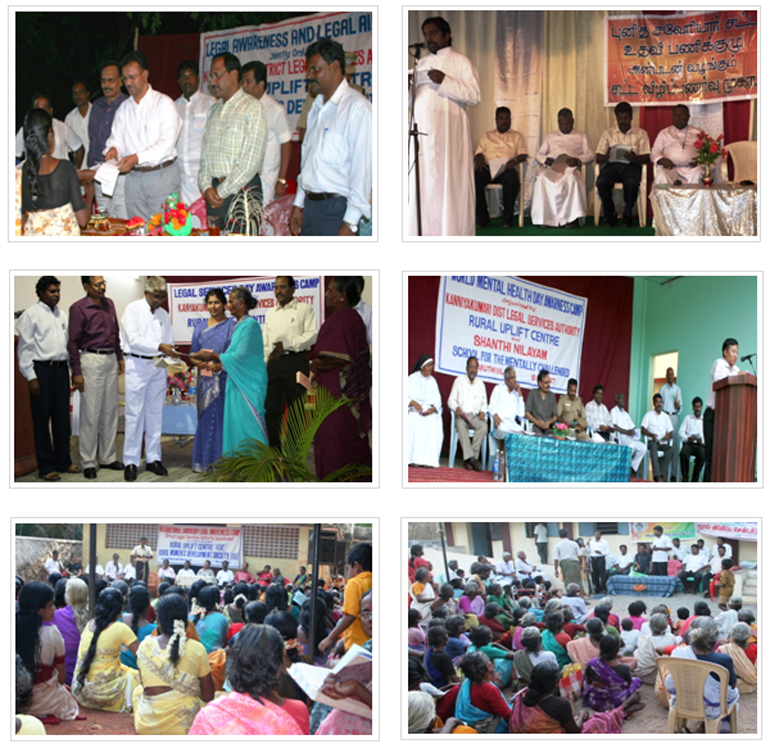 Organized twenty one Legal Aid Camps in collaboration with District Legal services authorities, District administration, police department, NGOs namely Rural Women's Development Society - Nagercoil, Kottar Social Service Society - Nagercoil, Legal aid Ministry - Kottar Diocese, Social Action Movement - Kanyakumari District and community based women's organizations. 2413 grievance petitions were received during these legal aid awareness camps. Established four legal aid assistance cells at Nagercoil, Nanguneri, Mudaloor & Tuticorin to provide legal aid. Grievances are prepared and helped the victims to present it before the Legal Services Authorities, Courts, Police stations, Executive magistrates and other human rights protection institutions for redressal. The RUC panel of advocates supported 211 victims in the process . • Conducted thirty two conferences jointly with Women's Association for enacting the bill on 50 percentage reservation to Women in central and state Legislative bodies, four campaigns against dowry harassment, seven campaigns for "Stop Violence and Poverty on women and children" ,one campaign and public hearing against corporal punishment and one campaign against torture. There are 14479 women participated in the above campaigns and conferences. Organised annual campaigns against torture and custodial justice in support of UN day on Torture. Prepared and published the following Laws in simplified regional language for the benefit of the ordinary people. Protection from sexual harassment at work places. Women's rights violations monitoring guide. Resource materials on Fundamental Rights, PIL, State responsibilities, Human Rights Standards, Human Rights Institutions, Laws on local Governance, Criminal Justice system. Resource materials on Constitutional Rights for women, Women's laws and Judgment Responsibility of Women's commission, International Human Rights instruments and bodies, Need for Reservation to women in Legislative bodies. NGOs, Women's organisations and people's movements in Kanyakumari, Tirunelveli & Tuticorin Districts, Tamil Nadu are able to assert the rights of the victims through their own associations. 51 Panchayat level women rights monitoring committees having 805 members were formed. Women's Rights awareness trainings enabled to acquire the capacity to participate in the Panchayat at various levels. 45 women victims asserted their rights and got back 1642 gms of gold ornaments and Rs.10, 15,000/- cash. 50 women victims received back their household articles worth Rs.4, 07,500/- as per the direction of the court. Rs.16, 65,000/- cash was awarded in the consumer cases filed by 7 victims. 2 families were awarded with a monthly maintenance of Rs.5000/ and Rs.2000/- maintenance to one family. One woman got back her child under her custody. Two family disputes were settled peacefully, out of court. Ten succession certificates were received. 6 persons were released from false cases. Land title deed obtained for 42 dalit families worth Rs.24 lacs. The counselling courses made eleven separated couples to joint again for peaceful life. 2413 grievance petitions had been submitted to District Legal Services Authorities and only thirty percentages of the grievances were solved. 211 women victim beneficiaries benefitted with the guidance of expert advocates & paralegal staff of RUC. Nine disputes were solved out of court proceeding through counselling. Five victims of domestic violence got justice and are free from their disputed husbands (divorce). One of the victims got 50 percentage share of the property.